Last time I had 2 sides finished. 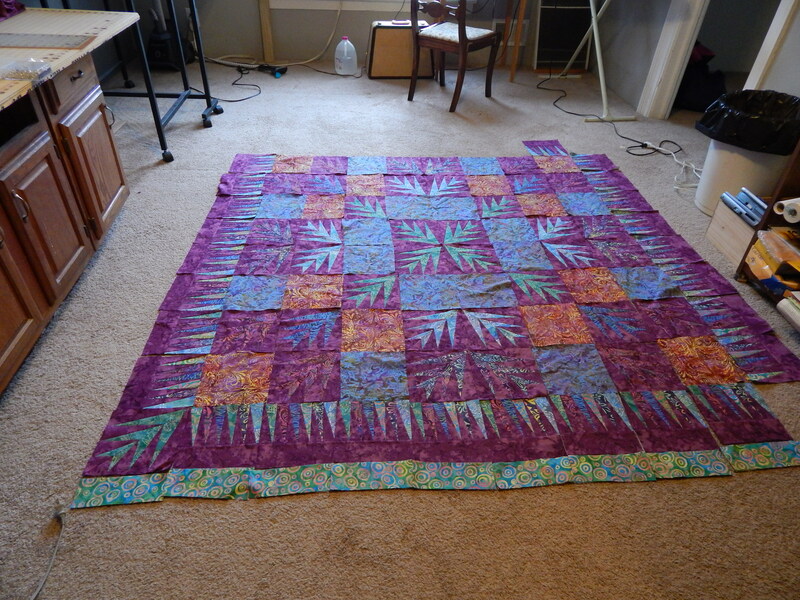 It seems to be taking forever….but I should be able to finish the piecing tomorrow. It has been a great luxury to have the space on the floor to lay out the blocks and still have room to work. 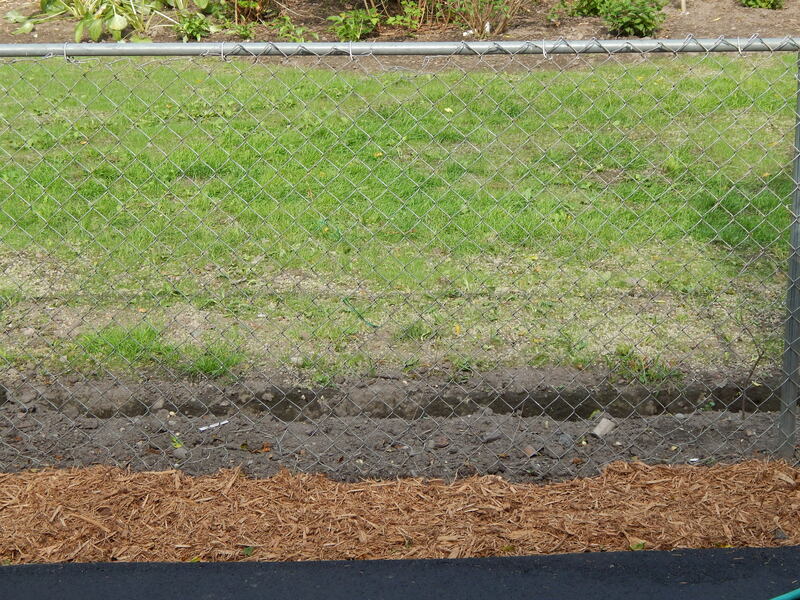 I will be planting the space around the edges with flowers and shrubs. Most of that will have to wait for spring. 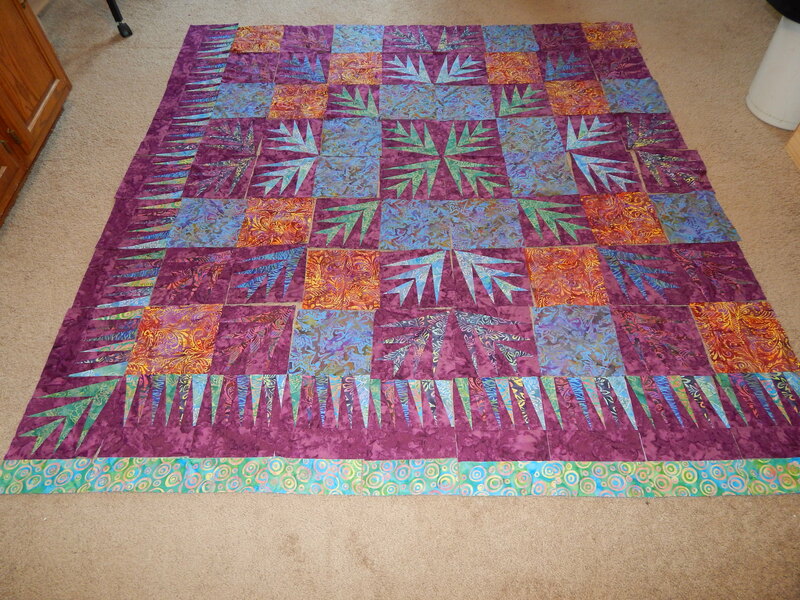 This entry was posted in Flowers, Garden, Quilts and tagged Gardening, Quilting, Quilts. Beautiful garden, of course! The quilt will get there, you have accomplished so much these past few weeks, remember! Beautiful flowers!! And piecing that border does take time,Sure is pretty though! Everything is so pretty. I’d sure like to know what plant it is you have under 7484 and 7485. I love it. Thanks. I will try to get some for next years garden. I wish Queen of the Prairie could grow where I live. I’ve never seen anything like it; must have missed it in your blog last year. I like this quilt with the extra blocks in it. I love to see your progress outdoors and in. Please keep blogging! You’re making good progress on the quilt top. What kind of tree is the pink one in the 4th picture? I think it’s beautiful along with the yellow roses and the pink flower that looks like a rose. Your whole garden is pretty. Makes me feel happy each time I see photos of it 😄. Today I really needed that. It’s the Queen of the Prarie….I thought it was a tree because of the way it looks in the first photo. It may be slow but it is beautiful. Just as seed is slower than sod in time it is all the same. Having fun watching YOU pull this new house together. Hi Tim, I admire your work and your advice is much needed. My daughter was given this quilt top many years ago by her husband’s grandmother. The dresden plates are not fused and the points are raw edged and then appliqued with a blanket stitch. I am going to hand quilt it for her finally,but not sure how to do this edges. How would you go about this? Thank you so much. well if they are blanket stitched I would leave it at that….